The Ojai Valley Land Conservancy (OVLC) is hosting an Open House featuring the California Naturalist Certification Program that will be offered in early 2019. The Open House will be held from 2 to 3 pm at the OVLC Offices, 370 W. Baldwin Road- Building A4. Light refreshments will be served. Drop in and meet the class instructors, as well as several California Naturalist graduates who will be sharing their experiences and showing off their Capstone Projects. The Naturalist Program certification introduces students to the wonders of California with a special focus on the Ventura River Watershed’s unique ecology and engages volunteers in the stewardship of our natural communities. The program combines science curriculum, hands-on learning, problem-solving, and community service to instill a deep appreciation and understanding of the natural environment of California and to inspire individuals to become guardians of their local resources. 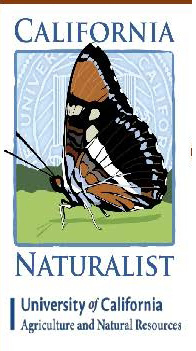 The next California Naturalist training program will be held on Friday evenings with Saturday field trips (February 1 –March 9, 2019). Early Bird registration ($375) runs from December 1–January 1 ($425 after January 1). Two limited scholarships ($175) are available for qualified applicants. For more information on classes, visit The California Naturalist website.